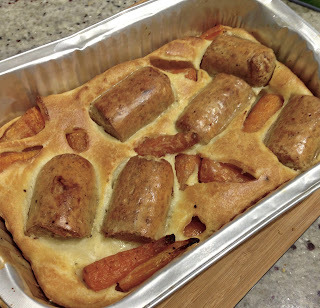 Given it's Guy Fawkes (bonfire night) here in the UK, I thought I would post a lighter, arthritis friendly version of the traditional toad-in-the-hole recipe. It makes a great bonfire supper served with green vegetables and baked potatoes. It also reheats well so you can make it in advance for a party. I've reduced the fat content of the traditional recipe by using low fat sausages or quorn ones and cutting down on the amount of oil used. I like to add some roasted vegetables to the batter too - here I have used carrots but red onion, parsnip, squash and even leeks all work well. I personally prefer to use a tin foil tray to make this in, I find it conducts the heat well and helps the batter rise as well as being lighter to use on your joints but an ordinary roasting pan or even earthenware dish works fine. Do think about using a hand blender to make the batter if you have sore wrists or hands - it makes it the work of seconds and because it helps add air to the batter gives a really crisp toad in the hole, after all no-one like a soggy toad! Pre-heat the oven to 180C/392F. 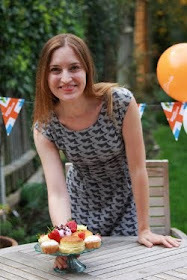 Place the flour in a jug and break in the egg, add a small amount of the milk and start to beat the picture with a fork. Gradually keep adding the milk until you get a thin batter (about the same consistency as single cream). ALTERNATIVELY chuck the batter ingredients in a jug and whizz up with a stick blender until smooth. Season the batter mix with a little black pepper and salt. Set the batter to one side. Slice any rough tops of the baby carrots and halve any that look a bit squat. Place them in a small roasting tin or foil tray and coat with the oil. Add the sausages and roast everything for about 20 minutes or until the carrots have softened and the sausages are beginning to colour. Remove the roasting tin from the oven, quickly spread out the carrots and sausages and then immediately pour the batter in. Return the tin to the oven and whack the temperature up to 220C/430F. Cook the toad-in-the-hole for around 25-30 minutes or until the batter is well-risen and browned. Don't be tempted to open the oven door until it looks cooked otherwise the batter will sink. Serve immediately. Selling your product through ClickBank is one of the best ways to quickly get exposure and sales for your product. Within a few business days, you can be up and running and have your product promoted by our huge network of affiliates!